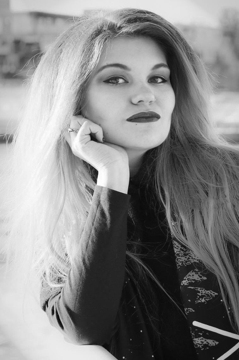 Dakota Hoska is a graduate student in the Master of Arts in Art History program. 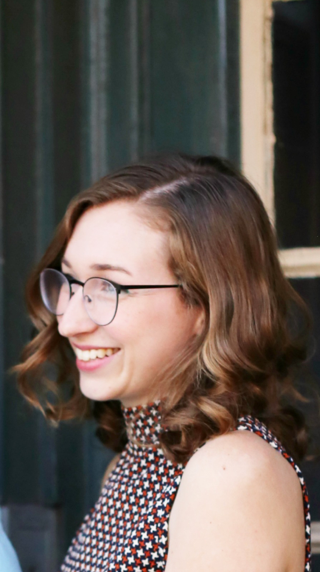 Dakota was awarded a Department of Art History Research Grant to support travel and research for her Qualifying Paper. There’s a lot I thought I knew. I had seen Andrea Carlson speak several times, and I had watched many of her interviews. We hold her piece Sunshine on a Cannibal at the Minneapolis Institute of Art where I work, and I have seen it installed on a few occasions. I thought I had good insights on this artist as a topic for my Qualifying Paper (QP), but, even so, many things changed after I was able to travel to Chicago and meet with Carlson in person. 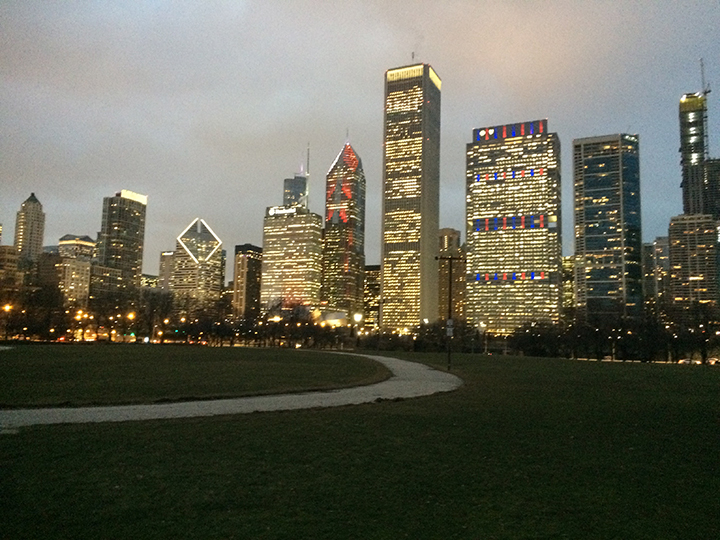 The opportunity to travel to Chicago was supported through a grant from the University of St. Thomas Department of Art History. I am very thankful that I was afforded that opportunity because it really influenced the direction of my final paper. Andrea Carlson is a deeply thoughtful artist with a very complicated deliberation process as it relates to the visuals found in her work. It would have been very difficult for me to whittle down which direction to take in my analysis of her work without meeting with her in person. Before going to Chicago, I had a 3 ½ page outline of things that I believed were possible to address in my QP. After meeting with Carlson, I was able to carve 2 ½ pages off my outline. Not simply because the topics were no longer relevant, but because after speaking with Carlson I realized the subjects were either SO meaningful for the artist that I would need considerable more time to address them than the QP allowed, or because I discovered the issues didn’t relate to the artist in the way I had assumed. 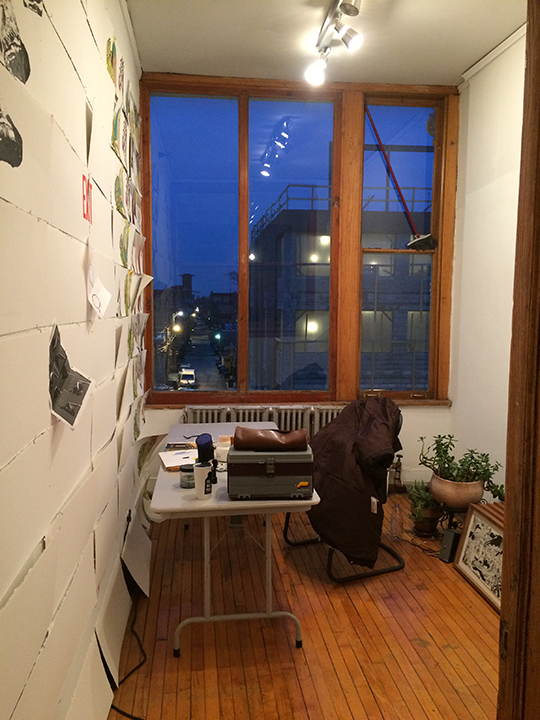 Andrea Carlson, studio visit. Carlson’s work is often so large, she can only see sections of it at a time because of her small space. Traveling to the artist’s location allowed me to visit her museum, meet her friends, and tour institutions where she often serves as an advisor or where she simply goes for inspiration and learning opportunities. This helped me prioritize the subjects I wanted to address in my QP as well as develop a new and very important professional relationship. After leaving Andrea after a long day of touring the Chicago Art Institute, she directed me to cross through this park to return to my hotel where I had a lovely skyline view of the city of Chicago. One day, I would like to do the first major exhibition of Carlson’s work, as well as produce her first monograph. I don’t know if I’ll get that opportunity, but if I do, it is this trip that began my journey towards that destination. I think non-academics may assume that we scholars are sitting home in front of our computers with stacks of books in front of us, seldom seeing the light of day. (OK, that is very true some of the time). But I think the best scholarship is closely tied to the personal experience, and travel grants like this one help to make those kinds of individual encounters possible. 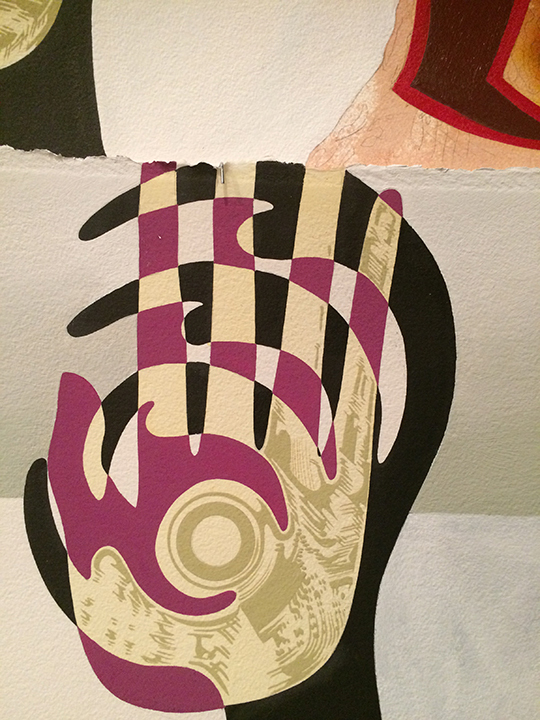 A sneak peek of some of the imagery Carlson is working on for her next big painting, Red Exit. My deepest thanks go to the University of St. Thomas Department of Art History for my grant. It really changed the trajectory of my paper, helped me streamline my research, and allowed me create a strong and lasting relationship with this very important Native artist, who I’m sure will continue to be a focus for me throughout my career. Abby Slawik is currently in her first semester in the Non-Degree Program in Art History. She is enrolled in Imaging the Other: Representation of/in Pre-Columbian and Early Colonial Mexico and Peru. Where did you go as an undergrad and what did you study? I went to NYU for studio art. What was your career prior to your decision to enter the Non-Degree program in Art History? I was a picture framer (design and production), as well as an art installer, for several years after graduation. I am also interning with a couple of conservation labs in the Twin Cities. These experiences have helped me understand some of the material language in the class. What drew you to the University of St. Thomas? Their course offerings are innovative, not overly generalized, and all have the potential for primary source study here in the Twin Cities. Also, they offer courses at night. I have a busy schedule during regular business hours with jobs and internships, so the class schedule really helps me out. What advice would you give someone considering graduate study in art history at the University of St. Thomas? Take advantage of all of the networking and professional development opportunities! The Twin Cities have a world-class, but accessible, arts community, and you WILL meet people who will help you out professionally. The arts/museum field is very competitive and sometimes you have to make it up as you go along. Don’t forget to stay flexible, stay interested, and have a plan B, and maybe a plan C too, just in case. I recently helped with a conservation treatment on an artwork by Simon Sparrow, a self-taught, or “outsider” artist. I am interested in studying the processes of this artist more in depth, and more broadly, how the “outsider” artist phenomenon caught on in the 20th century and sparked a cutthroat resale market. How are your classes this semester? I am enjoying the informal research we are doing in Dr. Barnes’s class about various rumors, scandals, or unproven theories. It is a real hands-on approach, and is helping hone my research skills. Keeping up with the reading is keeping me on my toes. I haven’t had this much homework for a few years, so I’m out of practice! I am also behind some of my classmates, because I haven’t taken any of the foundational “Methods” courses. 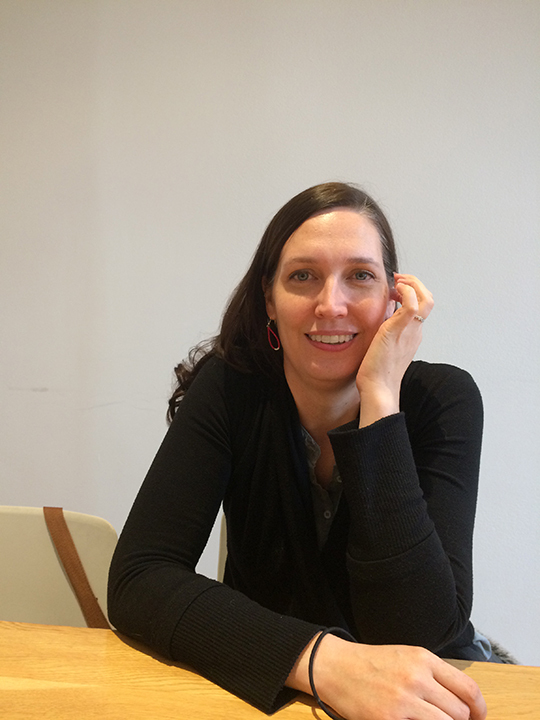 Michelle Turner is a graduate student in the Master of Arts in Art History and Graduate Certificate in Museum Studies program. Michelle was awarded a Department of Art History Student Research Grant to support her Qualifying Paper research. 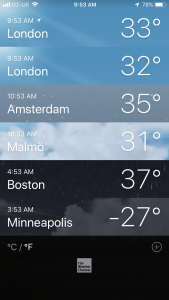 A screen-shot of the temperature differences between the locations on my trip and Minneapolis, which was experiencing the 2019 Polar Vortex. This January, right as the 2019 winter vortex hit, the University of St. Thomas provided me the opportunity to leave. Thanks to the Department of Art History Student Research Grant, I was able to travel to England and develop my Qualifying Paper abroad. My paper focuses on British artist Sonia Boyce and her ongoing relationship with wallpaper throughout the span of her career. Many scholars and critics either focus on the conceptual similarities across Boyce’s oeuvre or they silo her work into two camps: her drawings pre-1990 and her collaborative work post-1990. My paper aims to bridge Boyce’s art practice by also attending to the aesthetic. I was first introduced to the work of Sonia Boyce by Dr. Heather Shirey in her spring 2018 seminar “Afropean: Africa and Europe.” Boyce was suggested to me by Dr. Shirey as a possible research subject. My paper began by exploring Boyce’s visual commentary on Britain’s race relations. Her work was intended to be one case study among a collection of others that highlighted the disparity between ideas of diversity and inclusion. Yet, as I began to survey the breadth of Boyce’s work, in particular, her collaborative and often performative pieces post-1990, I became fascinated by her new use of wallpaper. In her pre-1990 drawings, wallpaper was used as a regular backdrop behind her figures, but in her later work, Boyce took wallpaper off the canvas and gave it new dimensions, the ability to engulf and alter the space we inhabit. 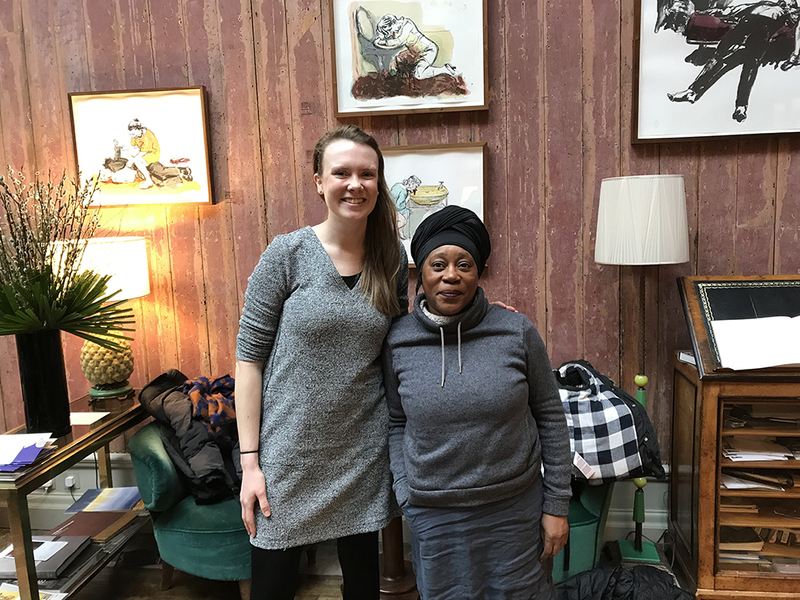 A photo with Sonia Boyce. Nervous that at any point I would step upon a source which had undoubtedly already written on this topic, I both voraciously surveyed whatever records and writings I could find and proceeded with caution. With less than ten days before our final class presentations, I emailed Dr. Shirey my intention to switch my paper’s focus. I was met with “you are in the trenches with the research, and you’ll be the best judge as to what is possible at this point in the research/semester.” I took that as a go. Ultimately the topic was well received and turned into my Qualifying Paper. Over the summer, I reached out to Boyce directly and in the fall, I applied for the Department of Art History Student Research Grant. 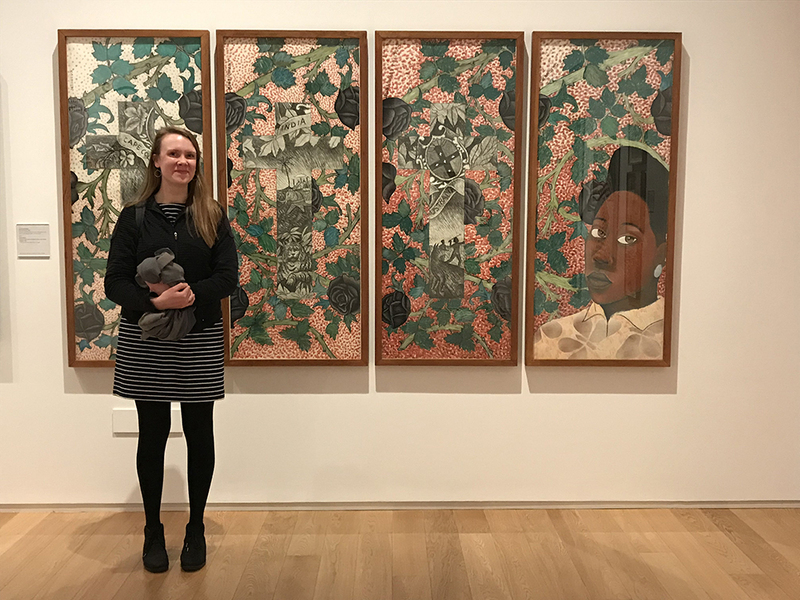 My time abroad allowed me the opportunity to see many of Boyce’s work in person, hold conversations with a number of art professionals who had worked directly with Boyce and/or her work, as well as meet and interview Sonia Boyce. Me in front of Boyce’s 1986 drawing Lay back, keep quiet and think of what made Britain so great. England was a RUSH but a wonderful one. My first day in the UK, I dropped my bags in London and travelled 2+ hours out of the city to visit the Royal Albert Memorial Museum in Exeter. Here I viewed “Criminal Ornamentation,” an exhibition curated by British-Nigerian artist Yinka Shonibare. Boyce’s 1986 drawing Lay back, keep quiet and think of what made Britain so great was a part of this show. Lay back, keep quiet and think of what made Britain so great was the work which first introduced me to Boyce, so it was moving to begin my travels by seeing this piece. A section of the Newham Trackside Wall, now empty. Sonia Boyce’s collaborative design will be installed on this surface before the end of 2019. Over the next two days, I ebbed and flowed around and out of London. I had the chance to visit the Arts Council Collection where Curator, Beth Hughes generously pulled Boyce’s 2010 etching I Have Found a Song for me. 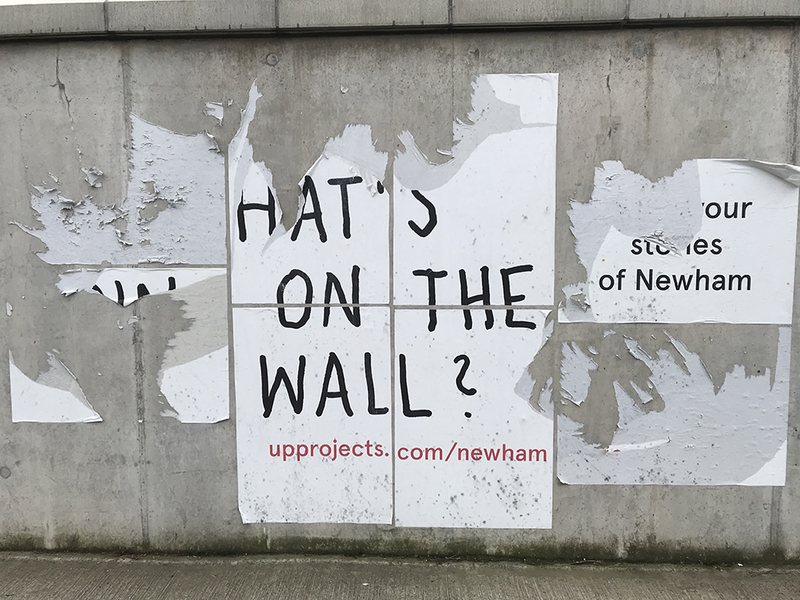 On another day, UP Project’s Commissions Curator, Niamh Sullivan introduced me to Boyce’s current commission project, the Newham Trackside Wall. 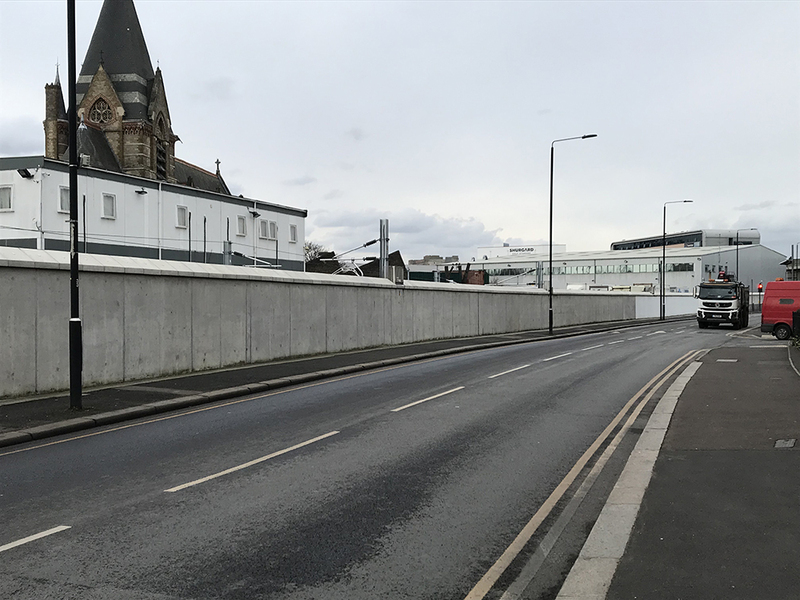 Due for completion in 2019, the Newham Trackside Wall will be the longest public artwork ever made in the UK, stretching over a mile long. Additional stops included the British Museum, The Lightbox gallery in Woking where Boyce’ work From Tarzan to Rambo: English Born ‘Native’ Considers her Relationship to the Constructed/Self Image and her Roots in Reconstruction was on view as part of an exhibition, and a detour to the Young Vik to see a one-man show by the actor who famously cried “You shall not pass!” to protect a band of hobbits. A section of the Newham Trackside Wall with remnants of wallpaper promoting the commission project. Following this run, I took the weekend to explore Birmingham and Manchester. In Birmingham, one highlight was seeing the exhibition “Women Power Protest.” Boyce’s 1985 drawing Mr. Close Friend-of-the-Family Pays a Visit Whilst Everyone Else is Out was on display here. A second highlight was visiting EastSide Projects and meeting Director Gavin Wade. Mr. Wade was kind enough to tour me through what the space was like when Boyce held her 2017 Wallpaper / Performance sessions at the gallery. In Manchester, the main stop was – as should come as no surprise – the art gallery. What did come as a surprise, however, was seeing Boyce’s 2018 work Six Acts on view as part of the permanent collection. This was the first material wallpaper by Boyce I had seen in-person; better still, it was installed and on view in a public space. 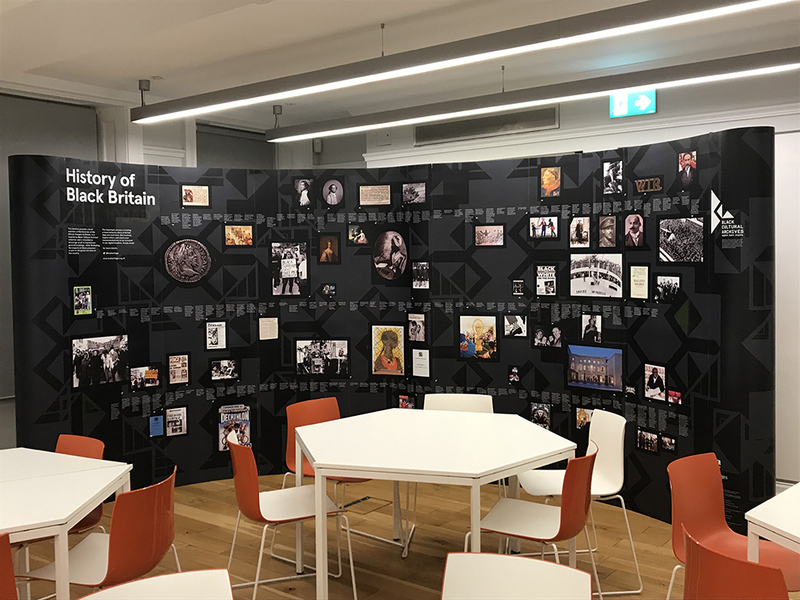 An educational panel of the “History of Black Britain” on display at the Black Cultural Archives in London. Returning to London, there was a lot to take in from the weekend, but a lot left to see and do over my last two days. Visits were made to the John Soane Museum, the Tate Modern, the Whitechapel Gallery, the Black Cultural Archives, and the Victoria & Albert Museum – where I was lucky enough to view an assortment of wallpaper samples, by Boyce and others, thanks to Senior Curator of Prints, Gill Saunders. Another thanks is due to Curator Claire FitzGerald of the Government Art Collection who led me past security and guards to see a large screenprint of Boyce’s Devotional chart in the Foreign and Commonwealth Offices. Of course, the trip came full circle by having the chance to meet Sonia in person. We met at the Royal Academy and she treated me to English cake and tea, a welcomed refreshment for one too nervous to eat anything beforehand. There may not have been any icing on the cake, I can’t remember, but none was needed. My thanks to all who in their generosity made this trip more than I could have hoped or imagined. 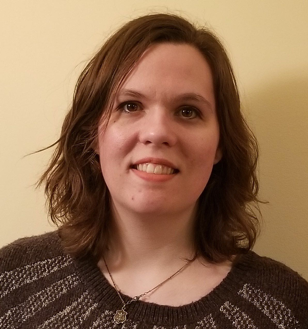 Ann Arntson recently completed her first semester in the Museum Studies Certificate program at the University of St. Thomas in fall 2019. I went to the University of Minnesota-Twin Cities and studied History. My emphasis was in Egyptian and Middle Eastern history. Why did you want to continue your studies with the University St. Thomas? I am currently enrolled in the Masters of Library and Information Science with an emphasis in Archives and Special Collections. A classmate told me about the Museums Studies program and I thought it would be an important complement to archives and libraries. What advice would you give someone thinking of coming to St. Thomas for the Graduate Certificate in Museum Studies? I would tell them that St. Thomas provides a supportive environment from both the Art History department and other students. I very much enjoy my time here because of this. Also, I would tell them to go to the department events! Psychology of collecting, especially how it applies to museums, archives, and other related fields. How were your classes last semester? The semester was good but very busy. I very much enjoyed Museum Studies II: Collections, Curation, and Controversy. I was also taking Archives and Mmetadata courses at St. Kate’s. Balancing coursework, student groups, networking, internships/jobs and personal life. Marilyn Burnett is a graduate student in the Master of Arts in Art History and Graduate Certificate in Museum Studies program. 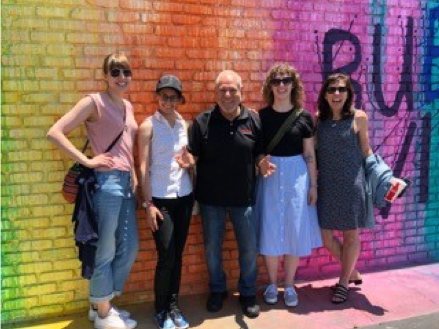 This summer, Marilyn worked with a team of graduate students and Dr. Heather Shirey to research street art across several major metropolitan areas in the United States. 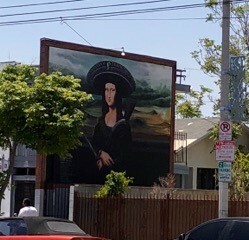 Los Angeles Art District. Photo by the author. 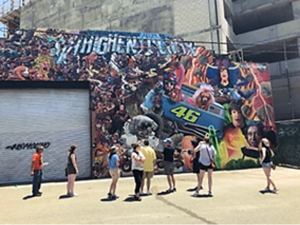 In the summer of 2018, I joined three other Art History graduate students and Dr. Heather Shirey to complete an independent study course investigating street art across the United States. We decided to do comparative research on street art by visiting some important hubs of street art in the United States, sometimes traveling together and sometimes separately. 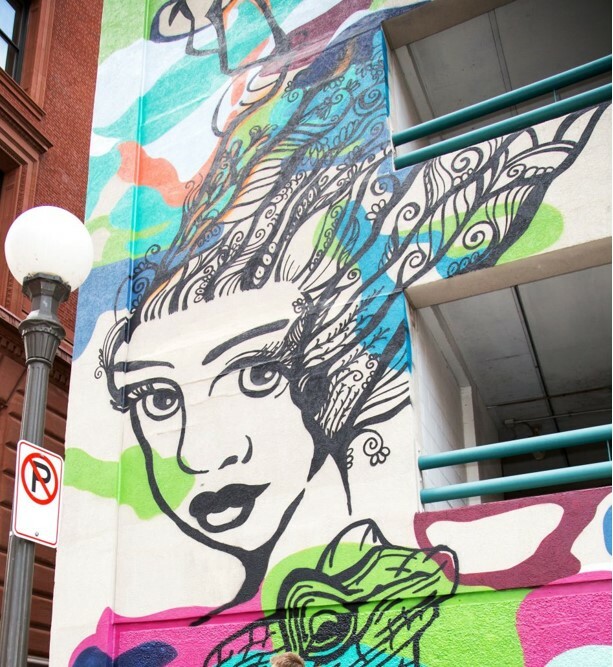 We started by investigating street art in our own city, St. Paul. We then visited Los Angeles together, and I ventured off to Denver on my own. The journey of learning about the art movement of graffiti, street art, and urban murals was a fascinating discovery of self-expression, placemaking, ambition, and profit. 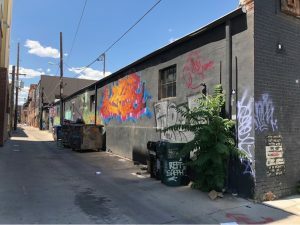 Denver RiNo Arts District, Photograph by the author. Graffiti started in the 1970s and 1980s as a form of rebellion against capitalism and coincided with the establishment of a subculture of rebellious youth in the crumbling inner cities. The sheer repetition of a writer’s signature or tag proclaimed individual worth and recognition, and tagging evolved into a competition for recognition and fame based upon risk, location, and artistic talent. The exaggerated lettering is generally intended to be understood by an internal audience, and so tags may be seen as exclusive to the crews and writers of the street, as the casual observer usually cannot decipher them. Street Art Independent Study class in LA: Kira Lipinski, Floris Lafontant, Gustavo Castillo, Theresa Nelson, Marilyn Burnett. Photo by the author. Next, let’s consider forms of street art that, like graffiti, are produced by illegal means, taking the form of images as an irreverent voice against capitalism and the establishment. This type of street art is inclusive because the sometimes political and subversive messages are intended for the casual passerby. Street art is contextual with necessary elements like location on the street and painting within the human scale to confer to the viewer the skill and risk of the painter and create a human connection. Its illegal nature allows for complete freedom of expression and also the potential for revision. The traditional rules of street art hold that other street artists add, respond or delete existing street art as part of a conversation balanced by a respect of established artists on the street. The risk of illegal art is part of the intrigue, and also becomes payment for the lack of external control regarding the subject matter or quality of the art. LA Miracle Mile area. Photograph by the author. Sanctioned murals, on the other hand, are generally commissioned, placed in the public realm, and therefore encounter control of content at several levels. The policies of the city, the property owner, the commissioning body and the funding body can all provide restrictions on content. There is a belief by ‘street art purists’ that sanctioned street art is the enemy of the spirit of street art. They claim painting for payment is unadventurous and a ‘selling out’ of the fundamental principles of street art. The reality is that Street Art festivals are wildly popular events across the world which foster paid urban murals labeled as street art. 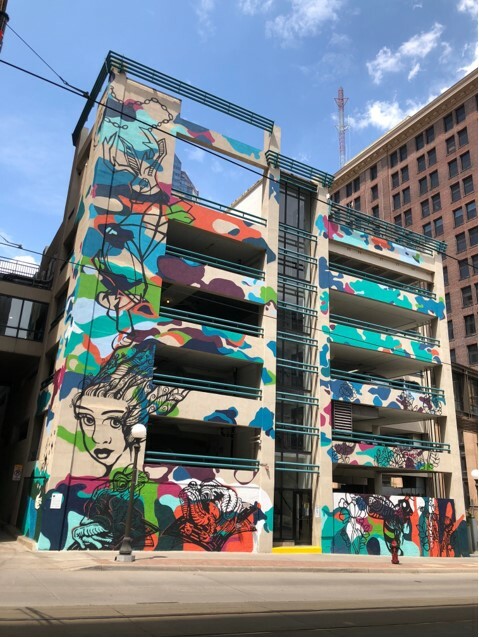 Urban developers capitalize on ‘creative districts’ and street art festivals which gentrify aging neighborhoods but also can raise property values and displace low-income families. Social media has provided a path to fame or invisibility in the glut of images online. Disdained by traditional street art, the internet is part of the future and provides opportunities for artist and individual interpretations. The lines of traditional street art are blurred and scholars and leaders in the street art world debate the next phase for the genre. Photo courtesy of the Minnesota Museum of American Art. L to R: Nicollazzi Xiong, Christina Vang, Vanghoua Anthony Vue, Xee Reiter, Shoua Yang, Melissa Vang. Photo: Sarah White. Vanhoua Anthony Vue is an Australian artist who identifies with his Hmong culture. Vue was selected for this project by the MMAA and wanting to be inclusive, he initiated Hmong community discussions and incorporated local Hmong artists into the project. 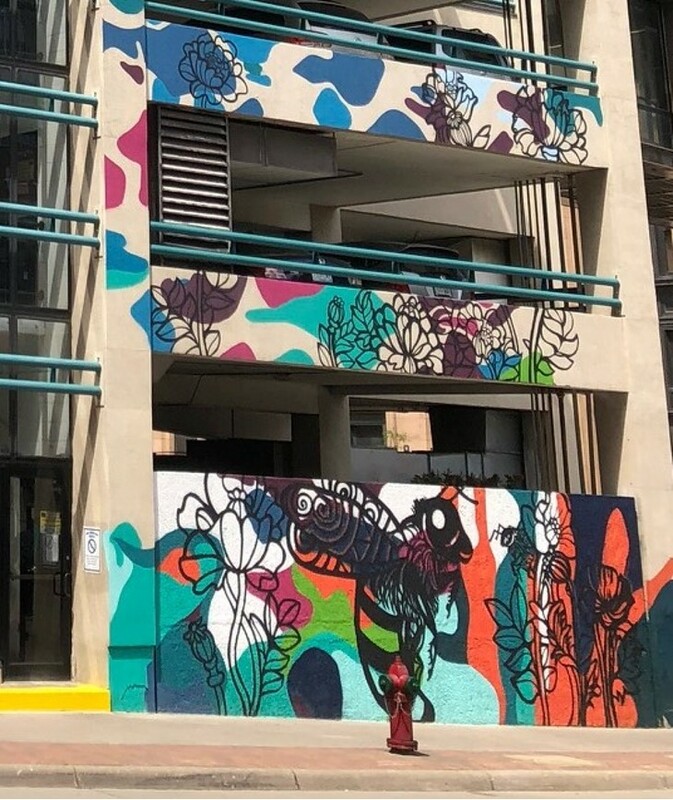 The mural on the Jackson Street parking structure, Flows of Interconnected Motifs, recalls traditional Hmong story cloths. Vue painted a colorful camouflage background upon which the local artists painted a personal motif representing the Hmong-American experience. The image is powerful as the camouflage veils the Hmong stories of misrepresentation and invisibility in plain sight. Flows of Interconnected Motifs. St. Paul, MN. Photo by the author. Honeybees and Poppies is a motif by Xee Reiter. The work references underlying tensions between Laos as an opium producer and the opiate crisis in the United States. Laos has a long history as a place of violence and war and displaced many Hmong farmers. Reiter gives a cultural nod to their survivalist nature and ability to thrive in areas of diaspora. ‘Honeybees and Poppies’ motif by Xee Reiter. St. Paul, MN. Photo by the author. The Jackalope is an illustration by Christina Vang. Her mythical creature is typical of oral Hmong folklore. The jackalope represents Hmong stereotypes of being both feared and a pest. She references the 2004 case where Chai Vang was convicted of shooting 6 people after they confronted him and hurled racial slurs for his hunting on private property. The murder of 6 people was tragedy mixed with racial tensions. An MPR story indicates cultural misunderstandings of private property, hunting seasons and that the Wisconsin hunting rules are not available in multiple languages. ‘The Jackalope’ motif by Christina Vang. St. Paul, MN. Photo by the author. Healer is a motif by Melissa Vang. The depiction of a woman with herbs and leaves in her hair is inspired by the Hmong women who have generationally passed down the knowledge of how to ease pain with plants and herbs. This motif honors Hmong cultural healing but is reminiscent of opium pain-killing properties. Possibly linking the commodification of this innate healing knowledge to companies who financially benefit from this ancient practice without reciprocation to the women who possess the knowledge. Photo courtesy of the Minnesota Museum of American Art. ‘Healer’ motif by Melissa Vang. St. Paul, MN. 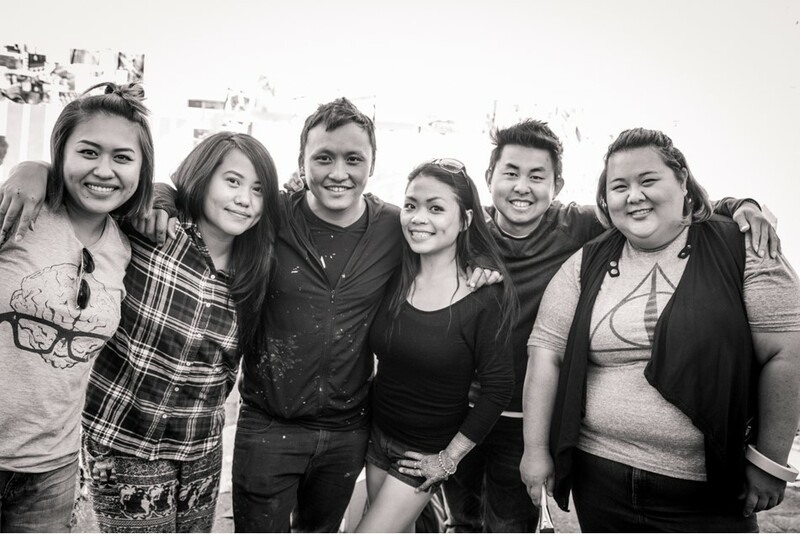 Photo courtesy of the artists. Wood Frogs is a creation by Shoua Yang. Yang feels that wood frogs represent the Hmong people and their amazing ability to adapt. The wood frog is known for the adaptations which allow its body to actually freeze in hibernation. The frog might also be a metaphor for the suffering that the Hmong have survived. Frogs have a special meaning in Hmong spirituality for initiating a curse which brought suffering and restricting man’s access to the spirits and the Otherworld. Photo courtesy of the Minnesota Museum of American Art. ‘Wood Frogs’ motif by Shoua Yang. Photograph courtesy of the artists. The next chapter of street art is appearing in the form of sanctioned urban murals. They share the street with traditional street art and can share the power of their message through a call for documentation versus the alternative definition of wallpaper. 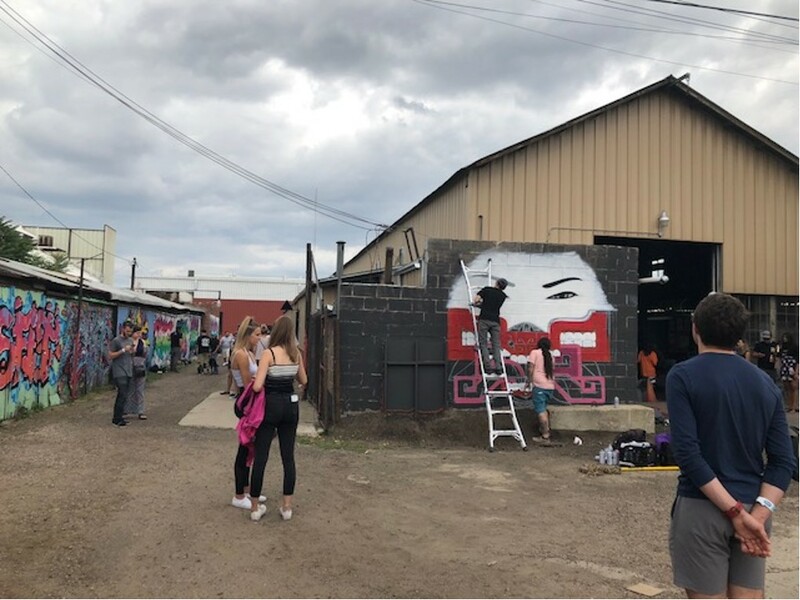 The St Paul Mural project can serve as an example of community building, respect, giving voice to the struggles of a displaced people and for white-led institutions to hear them. 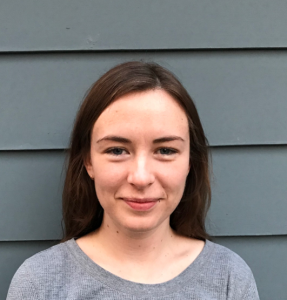 Molly McIntosh is currently in her first semester of the Master of Arts in Art History and Graduate Certificate in Museum Studies. She is enrolled in Methodology and Approaches of Art History and Museum Studies II: Collections, Curation, and Controversy. Where did you go as an undergraduate and what did you study? I studied at the University of St. Thomas and majored in History. What were you doing before you decided to switch gears and get your Master of Arts in Art History and Graduate Certificate in Museum Studies? I volunteered at a local historical society – the Aitkin County Historical Society and the MilleLacs Indian Museum while continuing to work at the Minnesota State Capitol as a historic interpreter. What drew you to the University St. Thomas? I mainly came for the museum studies program. I had been made familiar with it beforehand from some of my professors in the history program. They said it was a good fit for me because I was always talking about museums. I was offered a museum fellowship with the Minnesota Historical Society (MNHS) at the History Center. This is a fellowship that they do once or twice a year to help young professionals navigate the museum field. I accepted that, and it was awesome! Were you designated to one department during the fellowship or did you do a little bit of everything? The Museum Fellows do a little bit of everything. We get to meet a lot of professionals at the Minnesota Historical Society from different areas. I got to learn a little bit about grant writing, the process of asking for donations, the educational side of it, as well as programming and finance. People from MNHS would come and do a talk in front of the class about what they do and then you did a lot of reading on their area of expertise, which was intensive. We ended with a week-long trip to Chicago to see over a dozen museums. It was a great experience! What advice would you give someone thinking of applying to the M.A. in Art History and Museum Studies Certificate program? If it was for the Graduate Museum Studies Certificate I would definitely tell them to do internships, volunteer, or try to secure a position within some historical society or within a museum and feel your way through. There are so many paths that you can take in museums. When it comes to art history, I’ve explored a lot into the history of tattoo art, body art, and some body modification. I think it is a form of art that is really underappreciated, especially considering it has an unconventional canvas. There are some fantastic tattoo artists in the world and here in Minnesota that are underappreciated because their art comes from a different medium. I would like to see more tattoo artists and graffiti artists in particular, being given the chance to display their art in a formal way and given the time of day for what their talents are. I would like to see their work considered in the same way that people appreciate the old masters or contemporary works. My classes are going great. I enjoy the challenge of upper-level courses and the gratification of learning things that pertain to the career field I aspire to work in. I’ve also made great new friends with like-minded people as passionate as I am about art and museums. The biggest challenge with graduate school is the time and the expense. You’ll see a lot of people in graduate school from all walks of life, some people more settled and those that aren’t more settled. I went to undergraduate here mainly on scholarships and grants. I was very lucky to graduate with very minimal loans. I didn’t come from a particularly well-off family. Graduate school, for me, is working three jobs and working six days a week and devoting myself to what I am really passionate about. It makes it all worth it in the end, but you just need to remember you are going to school for something you are passionate about. Keely Wardyn is currently in her first semester in the M.A. Art History program. She is enrolled in Methodology and Approaches of Art History and Sacred Spaces in Unexpected Places. I went to Minnesota State University – Mankato. I studied Art History. Previously, I got an associate degree at South Central College and took a year off afterward and went to Italy, Switzerland, and France. My advisor, Alisa Eimen highly recommended St. Thomas for me. I wanted to stay in the state, which leaves St. Thomas and the University of Minnesota. I knew I didn’t want to go to the University of Minnesota – I just knew it was going to be a competitive atmosphere instead of a collaborative one and that’s not what I was looking for. She recommended this program, so I applied for it and got in! What advice would you give someone thinking of applying for the M.A. in Art History at St. Thomas? Come in very open-minded and be willing to communicate with the faculty. Heather Shirey (Associate Professor and Director of Graduate Studies), emailed me after a week to check how I was doing with my classes and the commute to campus. Having someone to communicate with has been very important to me. I am really interested in Persian art – especially manuscripts pages. The project I did for the Minneapolis Institute of Art (Mia) undergraduate symposium explored a manuscript page they have in their collection. I was actually able to uncover some pretty amazing things about its attribution that the museum was unaware of. For me, that was the point where I knew that I wanted to focus on Persian and Islamic art. They have been very good – extremely engaging. During my most recent Methods class, we had some amazing discussions. As for the Sacred in Unexpected Places, this has been amazing – getting to meet Bartholomew Voorsanger – that was inspiring to hear him talk about his work. Learning how to structure my weeks now. The last year and a half I haven’t been in school, so being disciplined about my time (and not binge-watching shows on Netflix whenever I feel like it) has been a change. After you’re in school for a while you just back into the routine. Basically, balancing full-time work and two grad-level classes continues to be the greatest challenge. Erdene Zuu Monastery in Kharkhorin, Övörkhangai Province, Mongolia. Erdene Zuu is likely the oldest extant Monastery in Mongolia. Sam Wisneski is a graduate student in the Master of Arts in Art History program. 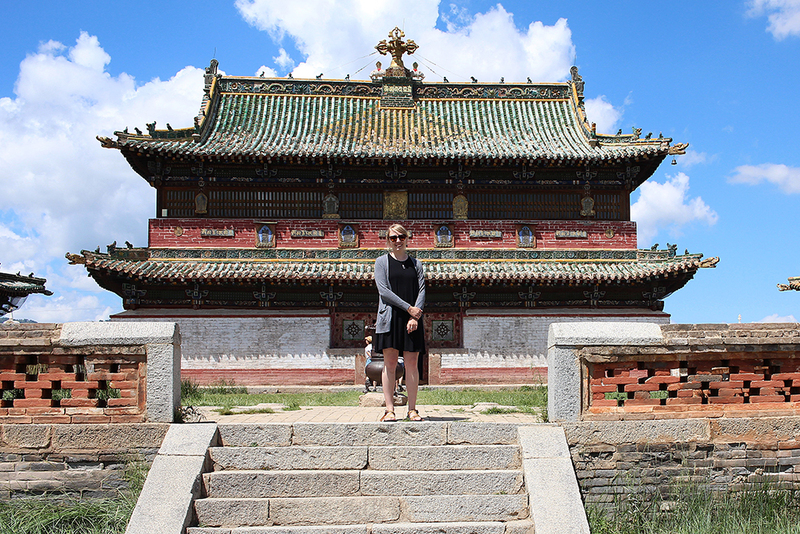 Sam was awarded a Department of Art History travel grant to participate in a Buddhist Art field seminar in Mongolia this summer and to conduct research on contemporary art in Ulaanbaatar. In July 2018, I had the opportunity to travel to Mongolia to study Buddhist art and architecture and contemporary art. As a recipient of a Department of Art History travel grant, I spent a month traveling in both rural Mongolia and in the capital, Ulaanbaatar. My goal for this trip was to learn more about the historical development of art and Buddhism in Mongolia, in order to better understand modern and contemporary Mongolian art. This was not my first time visiting Mongolia. I had been there for an extended stay in 2016 where my exposure was limited to mostly rural life, but it proved to be an absolutely invaluable and formative experience. Since returning to my graduate studies in 2017, I felt strongly that I wanted to visit Mongolia again, but to examine it with the eyes of an art historian. During spring semester 2018, I enrolled in Dr. Elizabeth Kindall’s Buddhist Art class, where it first occurred to me to examine Buddhist imagery in contemporary Mongolian art. It was one of those few serendipitous moments in which my interests in Buddhist art and contemporary art intersected in an exciting way. 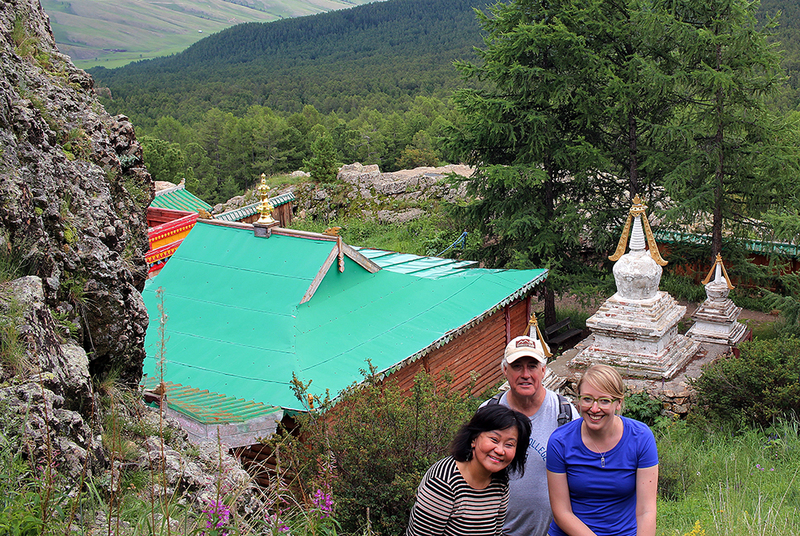 A few weeks into the semester, I got the chance to seriously entertain the idea of traveling to Mongolia again when I came upon a summer Buddhist art field seminar led by art historian Dr. Uranchimeg “Orna” Tsultem. For ten days, I traveled alongside Professor Uranchimeg with another pupil, a trip organizer, and our expert driver, mostly via the rutted dirt paths (a.k.a roads) in rural Mongolia. For a lot of the time, we were off-roading in a mini-van and occasionally found ourselves in some peculiar situations. At one point, we literally drove through a river. We had an ambitious itinerary with travel planned across several provinces. Unfortunately, we did not make it to all of the sites on our itinerary due to an outbreak of hoof-in-mouth disease that had stricken livestock in one of the provinces we planned to visit. With our altered itinerary, we split our time between two central provinces and the capital, Ulaanbaatar, where we visited many of Mongolia’s most significant temples, monasteries, and museum collections. We, of course, had to visit the famous ancient Mongol capital of Karakorum (Kharkhorin), home to (likely) the oldest monastery in Mongolia, Erdene Zuu. We also visited Övgön Monastery, with its charming clusters of small colorful temples, and the mountain retreat meditation caves and temples of Tövkhön Monastery, my favorite site on the itinerary. 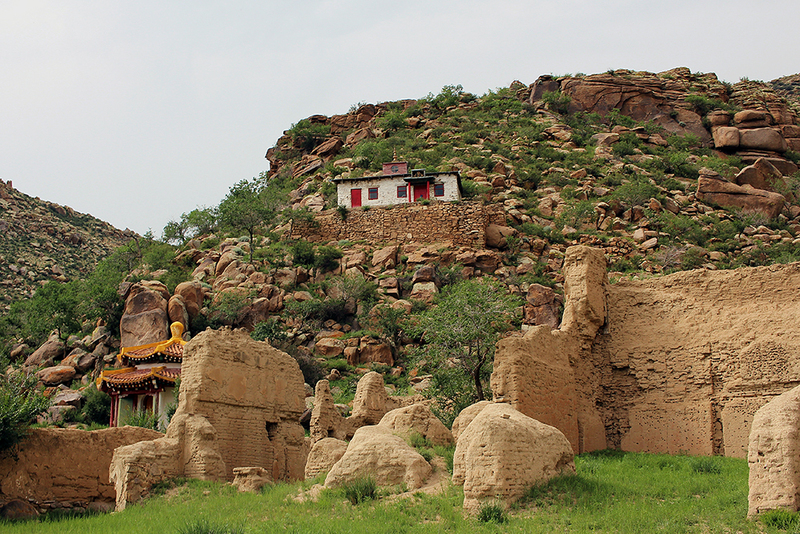 Tövkhön Monastery is situated in the mountains and has spectacular vistas.Visitors must drive to the base of the mountain and hike or travel by horseback to reach the monastery. I am pictured here with Professor Uranchimeg and fellow traveler, Jack. In Ulaanbaatar, we visited major Buddhist sites including the Gandantegchinlen Monastery, the Daishchoilin Monastery, the Bogd Khan Winter Palace Museum, and the Choijin Lama Museum. The latter two sites house impressive museum collections and several temples. We also visited the Zanabazar Museum of Fine Arts, which houses important Buddhist works, many of which were executed by the museum’s namesake, Zanabazar. Zanabazar was the sixteenth Jebtsundamba Khutuktu and the first Bogd Gegeen of Mongolia, effectively the spiritual head of Mongolia. He was also a polymath and artistic visionary and is credited with ushering in a golden age of art in Mongolia. 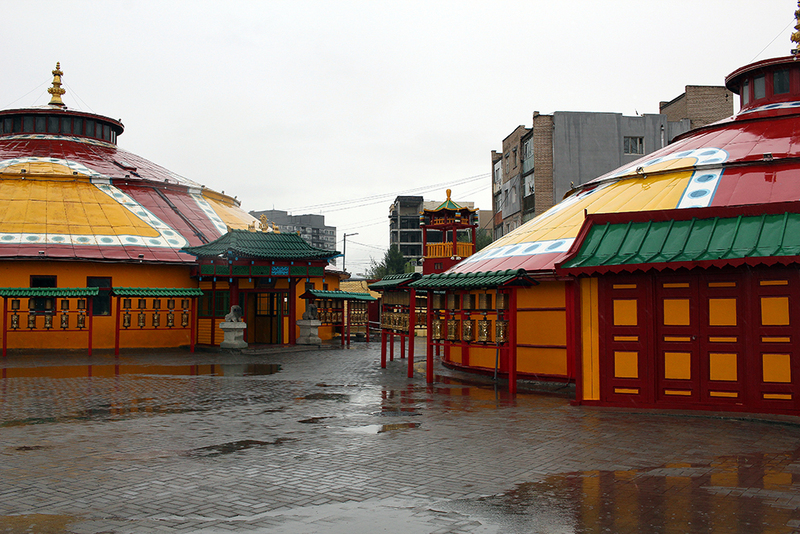 Daishchoilin Monastery has temples built in the shape of a Mongolian ger (yurt). Having dedicated the entire seminar to Buddhist art and architecture, it is shocking to consider that the sites we visited are only a tiny fraction of the temples and monasteries that once dotted the Mongolian landscape. It is estimated that more than 1,000 monasteries and temples were destroyed during the communist period (1924-1992). Only a handful of monasteries survived, two of which we visited. Since 1990, some monasteries have been rebuilt, and many Mongolians practice Buddhism once again, though its revival has not been without difficulty. Limited financial support and a young monastic community are just two of the challenges Buddhism faces in Mongolia. After ten days of the field seminar, I still had nearly three weeks left to explore Mongolia’s contemporary art scene. I planned to keep a loose schedule for those three weeks, with the hope that I could arrange some studio visits with artists, while fitting in gallery and museum visits as well. With the gracious facilitation and help of Professor Uranchimeg, I got in touch with several artists, many of whom are trained in the style of Mongol zurag (literally, ‘Mongolian pictures’). Mongol zurag is characterized by fine brushwork, vivid colors, narrative composition, and a flat perspective. I have long had an affinity for South Asian miniature painting and Tibetan thangka, so I was immediately drawn to the shared formal qualities of Mongol zurag. 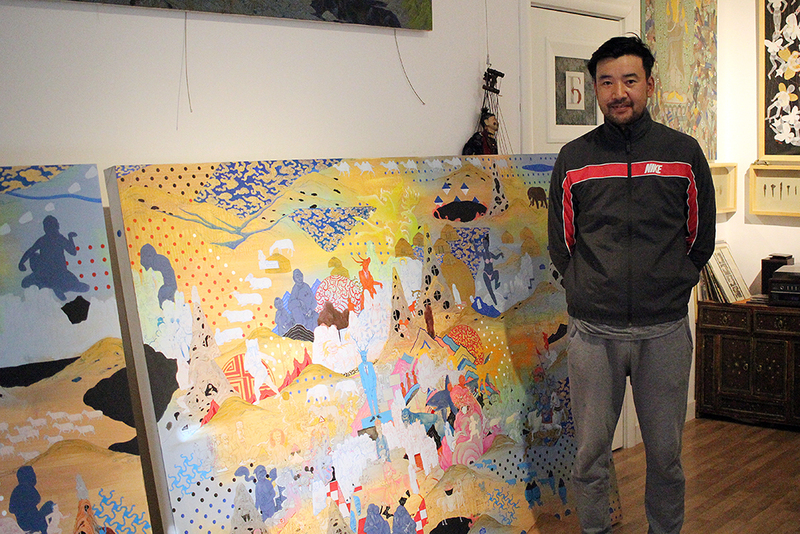 Mongol zurag artist Baatarzorig poses in front of his recent work, MGL. MGL was recently exhibited in “Five Heads (Tavan Tolgoi)—Art, Anthropology and Mongol Futurism” in London. I was eager to meet any artists willing to speak with me, but I was especially excited to meet two in particular: Nomin Bold and Baatarzorig Batjargal, two Mongol zurag artists who also happen to be married. I had followed both artists on Facebook and elsewhere online, hoping to someday see their work in person. I found their work vibrant, complex and rich with social commentary. 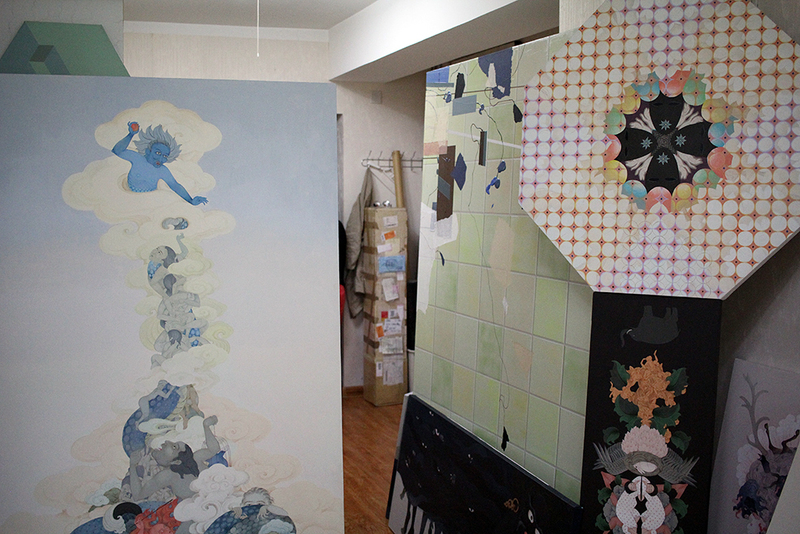 Works by Mongol zurag artist Nomin Bold in the artists’ joint studio. 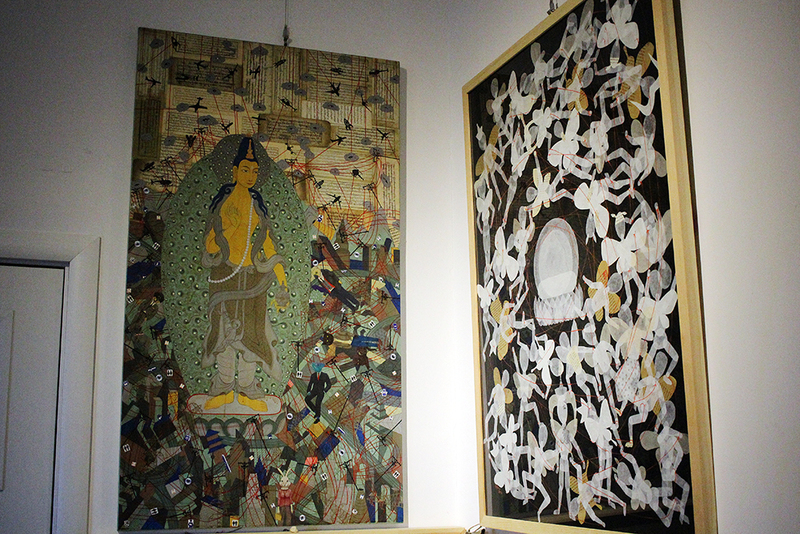 Works by Mongol zurag artist Uuriintuya, which were recently included in a solo exhibition at Art Space 976 in Ulaanbaatar in September 2018. I was quietly ecstatic and slightly nervous about the opportunity to meet Baatarzorig and Nomin, along with several of their Mongol Zurag peers, including Uuriintuya and Baasanjav. The hospitality and openness of each artist was humbling, and the experience reaffirmed my interest in contemporary art in Mongolia as each artist described their work and practice to me. 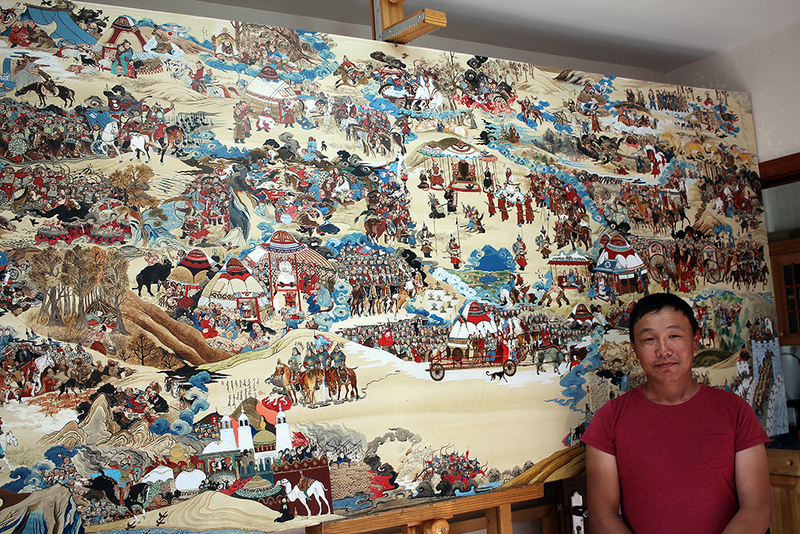 Mongol Zurag artist Baasanjav poses in front of a work in progress. This narrative painting contains scenes of Mongolian history. He has been working on this piece for three years now, on and off. The opportunity to see this work in person was incredible! Once more, I left Mongolia with a resolve to return and a deep sense of gratitude for all that I experienced. In addition to my advisor Dr. Kindall and the Department of Art History, I owe a special thanks to Professor Uranchimeg and my Mongolia Quest guide Ayush, and to the gracious artists who opened their studios to me. 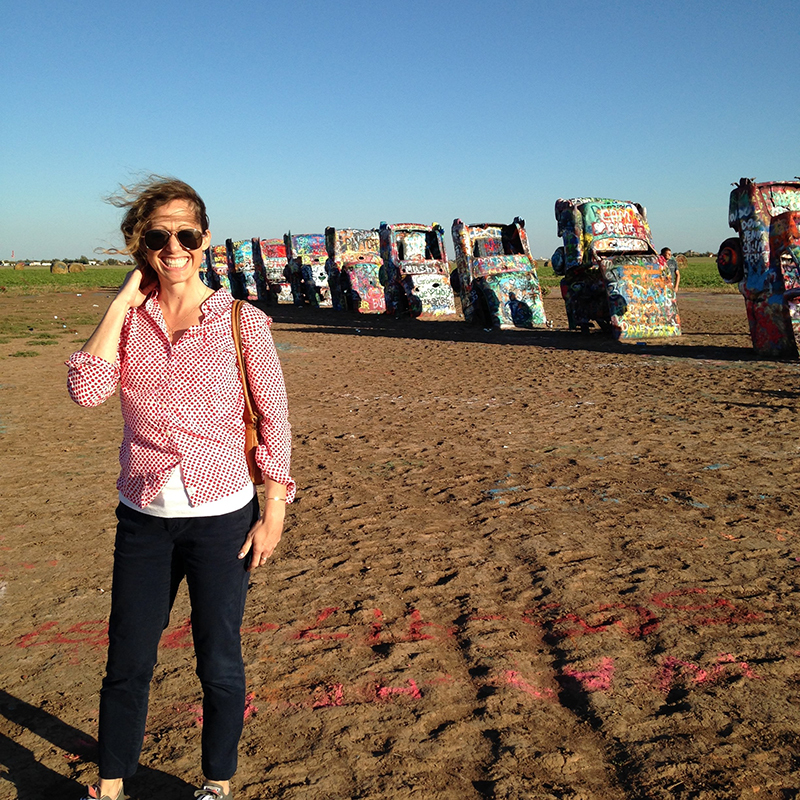 Emily at Cadillac Ranch outside Amarillo, TX. Meet Master’s Program alumni in our series Life After Graduate School. In this month’s feature, get to know Emily Koller, who graduated from the M.A. in Art History program. Emily currently works as a Planner with the Texas Historical Commission. I wanted to study historic preservation and architectural history and did not want to leave the Twin Cities. Once I met with Dr. Victoria Young, I knew it was the place for me. 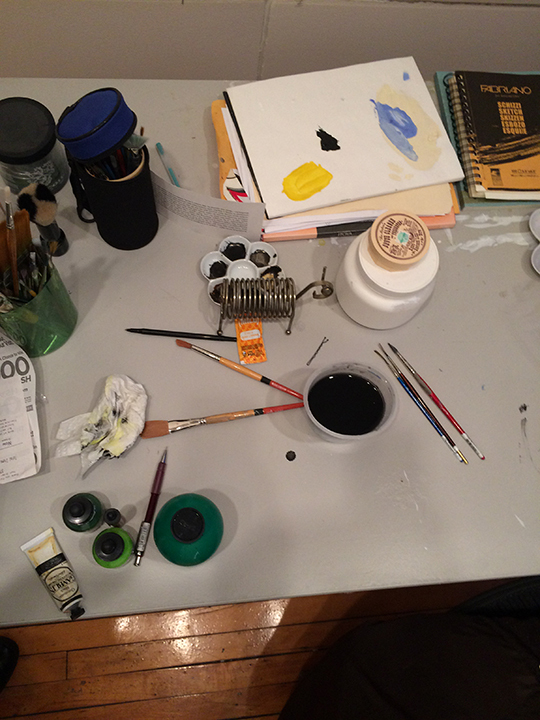 I appreciated the evening classes as I continued working. I think having students in the MA program that were working provided a real-world perspective that suited me. Everyone seemed so grateful for the opportunity that it created a really amazing, supportive and inspiring environment for learning. What was your favorite moment while a student at St. Thomas? Hmm. Exploring neon through Dr. Craig Eliason’s typography class was definitely a turning point, but the highlight may have been our trip to Chicago with our American Architectural History class. What are you up to these days? How did you get to where you are? I work as a planner with the Texas Historical Commission. My program is the Town Square Initiative and we focus on pro-active strategies to fill vacant historic buildings in downtowns across Texas. How has the time you spent in our graduate program influenced your career and life? Dr. Young helped me articulate my passion for historic buildings which led me directly to where I am now. While my planning degree provides some technical skills that are necessary for my work now, studying art and architectural history shaped the way that I write, think, present, create persuasive arguments. I still have many friends from the program and enjoy following their careers. I feel so proud of all of us. Overall, it was just a great education! Advice for new and current graduate students? Taylor Menendez is currently in her first semester in the M.A. Art History. 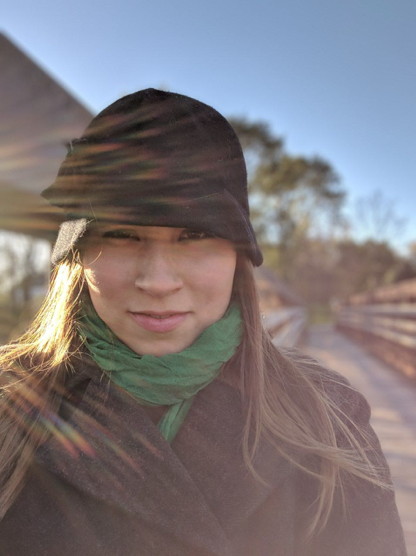 She is enrolled in Methodology and Approaches of Art History, The Sacred in Unexpected Places, and Museum Studies II: Collections, Curation, and Controversy. I went to Buena Vista University in Iowa. I studied studio art and Spanish. I especially liked installation art. For my capstone I created a large installation project. I was trying to decide if I wanted to get my MFA or M.A. in Art History. I wanted to go into museum studies, so I chose the Art History route instead of being a starving artist. St. Thomas had an art history program, but also a museum studies certificate as well. What advice would you give someone thinking of coming to UST Graduate Art History? Even if you live far away, still go for it. I can tell after the first couple of weeks here that this place has high standards for their students and professors really care about your future. I really like Dadaism and especially Marcel Duchamp – pioneer of the movement. But also, I like 70s performance art such as feminist artist Carolee Schneemann. I can’t forget my love for contemporary art. Being an artist myself, I am always trying to find inspiration. You find a lot of that in artists that are living today. Pretty good – it is a lot more reading than I am used to. I’m used to a lot of studio time, but I am keeping up. I don’t have a full-time job, just a part-time job at the Asmat Museum. I feel like I have plenty of time to do my homework for now. Moving here was really hard. Just trying to find a place. Trying to rent an apartment and schedule visits was difficult being so far away. I’ve never lived in huge city with more than 10,000 people. First, my husband had to find a job to see if he could move here with me. Then, we had to figure out which area we wanted to live in. It’s the little things – what hospital should I go to? Grocery store? You are relearning everything and trying to trust people.